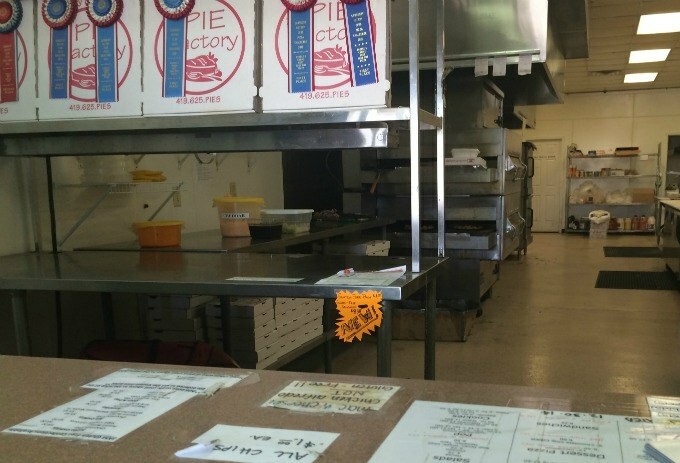 I first attempted to visit The Pie Factory & Bakery in Sandusky, Ohio on a day when I was exploring the area with my parent’s, sister-in-law and young nephew. Locating The Pie Factory & Bakery is a little tricky. Not bad if you’re paying really close attention but if you’re looking for a storefront on busy Perkins Avenue, you’ll drive right past it. The restaurant is located behind a couple other buildings. If you turn in to the parking lot for the tattoo shop that faces Perkins Avenue you’ll see a small sign directing you to the back of the building. Follow the sign and The Pie Factory is in what appears to be a warehouse. If you spot the sign and follow it, you’re golden. It wasn’t until we popped in for lunch that I realized they didn’t offer a dine-in option. We were an hour from home and traveling in my husband’s large extended cab truck, not an ideal place to eat a large pizza. It was also mid-winter and cold so eating at a nearby park was out of the question too. We left empty-handed with the intentions to return on another trip to the area. It took me a couple months, but I finally did make it back to The Pie Factory & Bakery to use my Restaurant.com gift certificate. This time I ordered a pizza and pound of boneless chicken wings ahead of time so they’d be ready for pick-up. We couldn’t have ordered at a worse time. What is normally an hour drive turned into more like an hour and 35 minutes because we were actually caught in a trifecta of summer traffic, construction and Bike Week. I thought for sure our pizza would be cold, but it was still warming on the oven. 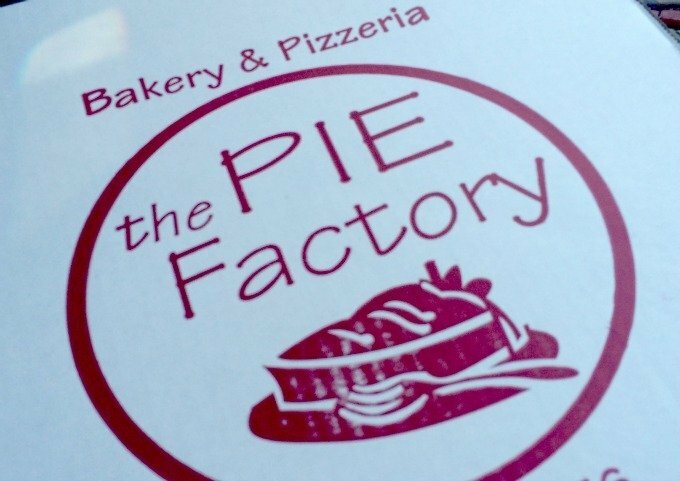 In addition to pizza, The Pie Factory & Bakery sells a variety of cakes, pies and cookies. 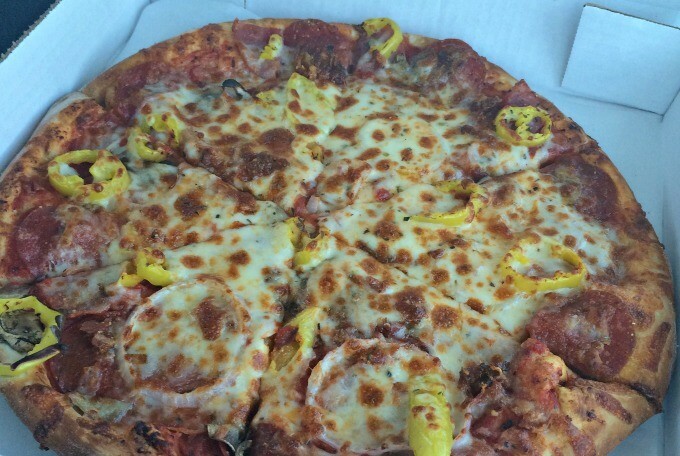 On a mission to eat at every pizza place in the state (not really but sometimes it feels like that), we skipped the sweets though reviews indicate that the Buckeye and Banana Cream Pies are both good eats. Both times I’ve stopped into The Pie Factory & Bakery, the employees have been extremely nice and helpful. Inside the building, you’ll find a bench to sit at if you need to wait on your order and in warmer weather there is a picnic table or two that allows seating outdoors but depending on the time of day you could be eating directly in the sun as there is no covering over the area. My husband and I opted to pick our pizza up and eat it on the go. I personally would have preferred to grab a seat in the park along Sandusky’s waterfront, but we had an appointment to get to. Maybe I’ll save that for another time. I ordered a Premium Supreme Pizza that came with Pepperoni, Ham, Bacon, Mushrooms, Onions and Banana Peppers and a pound of boneless chicken wings with honey mustard sauce. Thin and deep dish pizzas are available as are gluten-free. 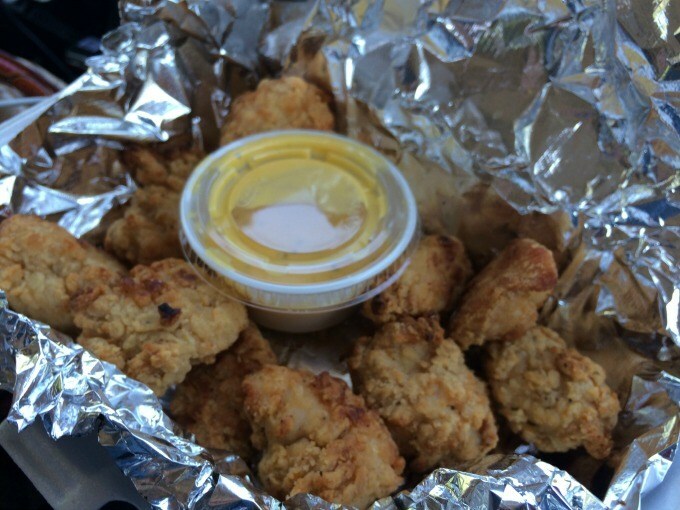 My husband and I both liked the boneless chicken wings and I thought the pizza was pretty good. Not a fan of the bacon that was on it (I kept burping it up later- ewww) but enjoyed the rest of the pizza. I will say that I am a fan of really thick pizza so I may have enjoyed it better had I ordered a thicker crust. The pizza has been voted People’s Choice for the past five years so I’m sure there are plenty of people that love it. Will I go back? Probably. If I’m in the area- especially if they add seating. Though it’s hard to find, it could be a fun space for dine-in. I probably wouldn’t drive back specifically for the pizza. I guess I’m just spoiled by some really phenomenal pizza places in my neck of the woods. 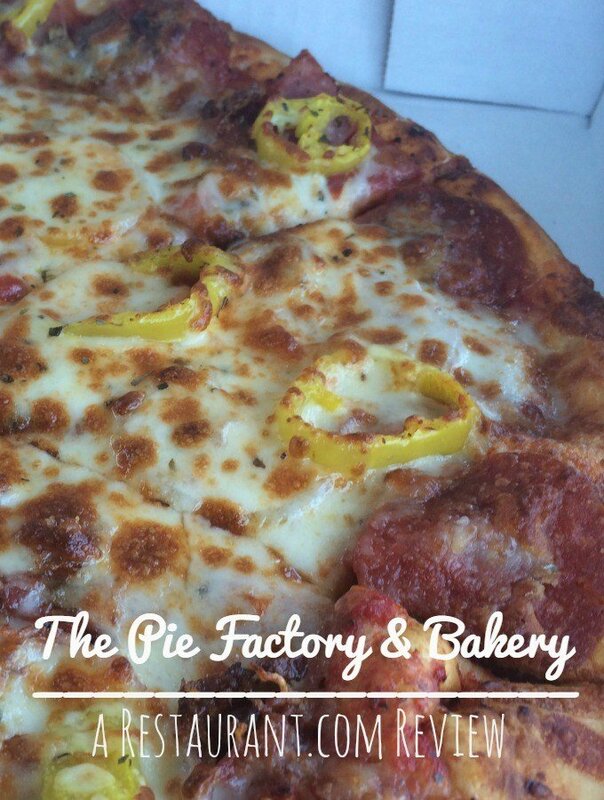 In addition to pizza, The Pie Factory & Bakery also serves pot pies, salads, sandwiches, fold-overs and pastas. Lots of options to choose from. Hours: Open every day at 10 a.m.